Berlin based dots Software GmbH re-created its web site www.dots.de from scratch: All content is brand new and implemented future-proof with current web technologies. Thus dots Software seized the chance to design its web site in a new way, geared towards usability and the future. The company blog is a central building block of the new web site. 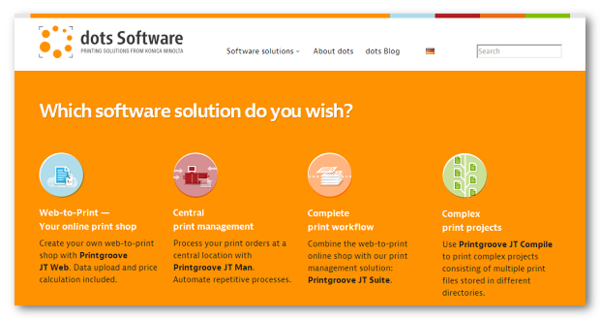 Here dots Software informs about product news, upcoming events and current affairs in digital printing. It goes without saying that the blog offers a RSS feed for subscription. Apart from the English content there is already a German version. A French translation will follow 2014. Base functionality is granted backwards up to Internet Explorer 7. But it is strongly recommended to use a modern browser. This press release was published at openPR.